The earliest Irish organization was the St. Patrick’s Society founded in the 1830’s. The Society assisted the Irish newcomers in adapting to the area as well as organizing the many events for St. Patrick’s Day. In 1870 the society became the Emerald Association and in the 1890’s established the St. Patrick’s Athletic Club in the North End. The Athletic Club was home to may great athletes including Jack Caffery, Billy Sherring, Tom Longboat, Jummy Duffy and Fred Hughson. In the early 1950’s the Irish community was searching for a social group that would also assist new arrivals from the Emerald Isle with integration and employment. After several meetings of the group at homes and in St. Patrick’s Church, they decided to start holding the meetings in the Knights of Columbus Hall. Thus the first organized meeting was November 1952 at the Knights of Columbus Hall on Jackson Street West, Hamilton. A man named John Patrick Roche was appointed chairman that evening. The naming of the club, election of an executive, development of a constitution, establishing the club’s purpose, and discussion of future activities were on the agenda the first meeting. To foster friendship and brotherhood amongst the membership. To assist members to adapt to the Canadian way of life, while maintaining their Irish heritage and culture. To promote social and intellectual exchange amongst the membership. 1953 February First banquet permit from the LCBO for a St. Patrick’s day dance. Cost was 25 cents. 1954 First Annual Club Picnic, held at Lake Erie (continues to present). 1958 May Club purchased first building at 147 Erie Avenue. Several members lived above clubroom. 1959 March New Constitution approved. 1959 October Club becomes incorporated. 1963 Mortgage for club is paid off. 1963 First annual Club Flight to Ireland. 1964 September Club moves to a larger site on Fennell Avenue East. 1965 Club purchases land to build Irish center (near Ryckman’s Corners). Project cancelled due to high cost. 1965 Purchased property at 2301 King St. East (at Parkdale). 1966 First Club Bingo held at the Serbian Hall on Barton St. East. 1966 July First Annual Feis at Civic Stadium with 1100 competitors. 1968 Formation of the Ladies Choir. 1969 First scholarship for university awarded to Sylvia Rogers. 1971 First AGM held at the actual Club, before this was held at banquet centres. 1971 May Irish Canadian Club Ladies Choir performs at Mohawk College for Hamilton’s 125th Anniversary. 1972 Number of Directors is increased from 8 to 11 (added were Recording Secretary, Building Chairman, Publicity Chairman). 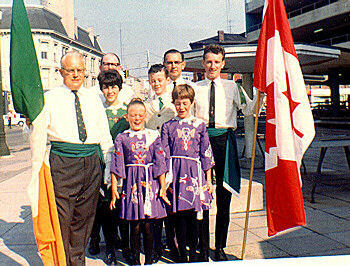 1973 Irish Canadian Club Ladies Choir represents Ireland for opening of Hamilton Place. 1973 Club establishes a bowling league. 1975 Golf Committee evolves from the Hamilton GAA. First tournament held at Copetown Golf Course. 1977 Board of Directors elect the twelfth position, In–House Entertainment Chairman. 1981 January Moved to current home at 389 Concession St.
1981 Additional scholarship added, for Community College. 1982 Club applies for a Lounge License. 1982 Beginning of Dart League. 1982 Irish Canadian Club Ladies Choir wins first place from Kiwanis Festival. 1983 Irish Canadian Club Ladies Choir wins first place from Kiwanis Festival. 1984 Irish Canadian Club Ladies Choir wins first place from Kiwanis Festival. 1984 Club builds a float for two parades, Hamilton Homecoming and the Santa Claus Parade. 1984 Irish Canadian Club Ladies Choir performs for Irish Ambassador at Hamilton Place. 1984 Spring Irish Canadian Club’s first newsletter. 1985 Club received Award of Appreciation from Hamilton and District Multicultural Council at Sheraton Hotel. 1985 Scholarship was renamed the “Pat Walsh Memorial Scholarship” in recognition of his dedication to the Club. 1986 Formation of the Wearing of The Green Committee. 1991 First Canadian–born president elected, Dan Galvin. 199 A History of the Irish Canadian Club of Hamilton was published, compiled by Pearl Jones and Gerry Mahoney. 1994 Formation of the Men’s Choir. 1999 The Feis returns to Hamilton. 2002 Club celebrates 50 years in style. The St. Patrick’s Society of Hamilton, founded in the 1830s, is the earliest direct antecedent of today’s Irish Canadian Club. Very much like our own Club, it was formed as a benevolent and cultural association to meet the needs of newcomers. Combining social welfare, moral uplift and entertainment, for many years the Society’s main public activity was organising the annual St. Patrick’s day celebrations. Behind the scenes, however, the Society played a vital role helping immigrants find family members, work and lodging. The Society seems to have died around 1857 but was revived in 1863. The St. Patrick’s band invariably appeared at public processions; they also gave concerts at the Mechanics’ Hall or in the upstairs room of the original Town Hall on Market Square. The Society occasionally hosted public lectures. By the late 1870s, it had given way to the Emerald Association. Twenty years later, the name followed the people from Corktown to the North End, reincarnated as the St. Patrick’s Athletic Club. During the summer of 1952 a stalwart band of a dozen people gathered to discuss how to form an Irish association in Hamilton. By the time the founding meeting was held, in November 1952, nearly 40 people were involved. Finding work was not always easy. One hard case was Tom Fallon. Asked what he did, he replied, “I shoe horses, oh aye, and I’m a thatcher too”. Not in great demand at Stelco! No–one lives on bread alone; the craic was just as important. The Club’s first public event was a dance at the British Imperial Club to celebrate St. Patrick’s Day, 1953. That first dance on a Tuesday night was a sellout. It was so successful the Club decided to hold weekly dances and the BI Club, thinking Tuesdays were a dead letter anyway, was happy to rent the space. For nearly five years, the Irish Club Tuesday night dance was a fixture, the pub–away–from–home where the Irish could meet to gossip, trade their woes and joys, meet their future spouses, make connections and find new work, get tips on the horses and pointers to homes. No self–respecting association can live for long without a crest, or a constitution. In 1954, founding President Pat Roche’s son Michael was assigned the first task. His design of green shamrock on an orange maple leaf remains our logo. With that triumph under his belt, he went to Hollywood to design movies. The constitution was more complicated, but Kieran Hynes, Eric Fleming, Bob Proctor and Pat Slattery devised a document based on any examples that came to hand. 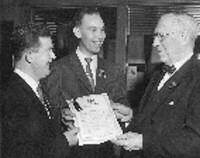 Once approved by the members, the constitution allowed the club to apply for corporate status and a provincial charter which was presented to Pat Slattery and Albert McDonagh by Mayor Lloyd D. Jackson on St. Patrick’s Day 1960. The success of the dances led to the obvious next step, to find their own place. In 1958 Pat Roche, Burris Ormsby, Jack Daly and Jim Lyons signed the mortgage on a house at 147 Erie Avenue. Five years later, the mortgage was paid off in full. During these years the Club’s property met all the original goals—it was the Irish community’s own social centre and the apartment upstairs provided accommodation for newcomers (who also took care of the place). Among the tenants were the McGibneys, the Doyles, Pat Walsh, and Harold Lavery. It was not all fun and games. The 1950s and early 1960s were not without their hardships. Irish immigrants in those years were not the shining new graduates of the Celtic Tiger. Many came as families, with lots of children. Those were very busy years for the Good & Welfare Committee. The Club’s minutes often report, “a donation was made to an Irish family.” Help for the needy, always recorded anonymously, might be a coat for a child, a sack of coal for the furnace, the cost of a funeral, rent money, a Christmas turkey, or even a plane ticket home to Ireland. “And they always paid it back, one way or another,” says Fred Morgan. The Irish Club was one of the first groups to organise charter flights. The regulation requiring all ticket–holders to be club members led to a scramble to sign up people to fill the first flight. They went to Ireland in September 1963 for three weeks, allowing GAA fans to get to the All–Ireland football final. On arrival, Kieran Hynes and Danny Rogers went straight to the Mansion House to present a letter of greetings from the mayor of Hamilton to his counterpart in Dublin. The inevitable gremlin popped up—two couples visiting family in Manchester were delayed and missed their connection for the return flight from Dublin. The Club paid for their tickets on the next regular flight. Good deeds, great rewards. Word spread and the Club’s flights, sometimes twice a year, were fully booked for the next decade. By 1965, the membership had outgrown the Erie Avenue space and the Club moved to rented space on Fennell Avenue. For technical reasons, having to do with the older darker licensing laws, the new clubroom was another echo from our Corktown past—a shebeen. Selling drink was illegal, but, well, ways can be found… And a discreet veil of silence (and the statute of limitations) can fall. Despite this shady background, the Club was well–established. Its members were in their prime and the range of activities reflected this. From 1965, the Club organised the annual Hamilton Feis—held on the July 1 weekend in Civic Stadium. Up to 1100 competitors participated and thousands of spectators came from all over Canada and the north–eastern United States. The Feis was an enormous undertaking: arranging schedules, building stages, selling tickets, providing refreshments and accommodations, all done entirely by volunteers. From 1966, a highlight of the Feis was the hurling and Gaelic football games presented by the Hamilton Robert Emmetts Gaelic Athletic Club, which was always closely associated with the Irish Club. The celebration of Canada’s centennial in 1967 was another excuse for a hooley, several in fact. The club put on dances, plays and concerts at Bennetto Auditorium and City Hall. A big group marched with the Irish float in the parade. The Ladies’ Choir, formed at an impromptu session in the Club in 1968, added another tone to our multicultural contributions. They were in great demand down the years, performing annually at St. Patrick’s day celebrations and regularly at Kiwanis music festivals. They sang at the gala opening of Hamilton Place in 1973 and for the Irish Ambassador in 1984. The best audiences were often the shut–ins, in hospitals and retirement homes. The Club’s men finally formed their own choir in 1994, at the instigation of Dan Galvin. The Club boasted its own in–house theatre group who presented plays from the 1960s to the 1980s. In the 1990s, the Club presented performances by seanchaí Jonathan Lynn and Bloomsday celebrations of James Joyce by Toronto’s Anna Livia Players. In 1970, more suitable premises were found in a former church at Parkdale and King. Once again, the mortgage was quickly paid off and the Club has been debt–free ever since. After a brief tussle with some of the neighbours who worried that a load of rowdy Irishmen would lower the tone, the new club opened with a (legal) bar in the basement. Upstairs, in the dance hall, the club moved onto the national stage, when Fred Morgan persuaded Denis Ryan to use the room as the set for taping a weekly Irish variety and music show for CHCH TV hosted by Ryan’s Fancy and Tommy Makem. By 1980, declining membership and rising costs led the Club to sell the premises on Parkdale and move to our current home on Concession Street, which we bought outright. Growing prosperity in Ireland and Canada lessened the load on the Club’s resources, but it also meant fewer immigrants were arriving. Without new blood, both the Feis and the GAA club were forced to fold in the 1980s. The soccer team, however, continues to compete in the city league. Nevertheless, the Club has never forgotten its original purpose. Newcomers are still made welcome. We still extend the hand of fellowship and sympathy. The Club continues to look to the future, and since 1969, we have awarded annual scholarships—named for Pat Walsh, in recognition of his loyalty and dedication—to university and community college students. The latest link in the chain of Irish voluntary associations is the Wearing of the Green Committee. Established in 1986 by local businessmen Bill Gardner and Ed Cummings to help promote Irish culture, the committee hosts the annual St. Patrick’s Day luncheon. Corned beef and cabbage and corny jokes aside, the luncheon salutes the committee’s choice as Irish Person of the Year: someone of Irish ancestry who has contributed to the betterment of the community. The committee worked with the Irish Club, the Ulster Club and the Ministry of Canadian Heritage to create the monument to the Irish contribution to Hamilton, unveiled in Gage Park. Repeated attacks by vandals forced the removal of the monument to its current site at City Hall. There, on St. Patrick’s Day, the Wearing of the Green hold a brief ceremony in memory of our ancestors. We cannot, of course, tell all the Club’s yarns in these pages. Instead, we offer a couple of vignettes representative of the breadth and depth of the Club’s history. In 1991, for the first time, the Club elected a President who was not Irish–born. A bookkeeper by trade, but better known to all as a fine singer with a wide repertoire, master of the trivia universe and Irish Person of the Year for 2000, Dan Galvin is the fourth generation of his name in Hamilton. His great–grandfather, James, came from Killarney, Co. Kerry with the Famine generation around 1850. Married twice, he had eleven children. One daughter was a nun and teacher with the Sisters of St. Joseph. One of seven children, Dan is also Irish on his mother’s side. His maternal great–grandparents were Mary Sliney from Cork who was married to Patrick McLoughlin from Antrim, captain of a lake freighter and a hotel–keeper. Daniel Galvin, Dan’s grandfather, worked for and then bought a hide company, dealing in leather for industrial uses. This family business, the Galvin Hide Co., occupied a prominent position on Market Square for many years. Dan’s father Martin worked as a travelling buyer in the family firm before finding a permanent position in the Customs and Excise in 1931. The line continues. In recognition of academic excellence and community achievement, Dan’s son Patrick won Mohawk College’s Gold Medal, which is only awarded in exceptional circumstances. “There were two things I wanted to do when I became president,” Dan told the Hamilton Spectator in 2000. “I wanted to organize a men’s choir and I wanted to have an Irish library filled with all the great writers of Ireland,” he says. He got the choir going in 1994 and now the 20 or so members go out to sing at nursing and retirement homes twice a month. “We sing sometimes for an hour. It just depends on the MC and his jokes.” And they’re always called back for more singing engagements. The library finally opened in our golden jubilee year. The circle is unbroken. In 1957, the Club’s founding president, Pat Roche, encouraged his nephew to emigrate to Canada. A newly graduated architect, Michael Torsney and his wife, Marie O’Gorman and their daughter Michelle, lived with the Roches for a while until they found their own apartment. By 1962, Mike had his own practice. His commissions included St. Joseph’s Villa and the public library in Dundas, Hillcrest and MacNab Recreation Centres, and Notre Dame High School. Retired now, Mike remains active, putting couch potatoes to shame by holding at least ten medals from Masters (over 60) World Swimming Championships for the butterfly stroke! Mike and Marie had four children. Michelle is a speech therapist, Sean lives in California and works as a communications consultant; Brian is an advertising executive; and Paddy is Liberal MP for Burlington. Meanwhile, the chain grew. Marie urged her brother John to join her in Hamilton. He arrived in 1960. When he and Marlene got married, the church was Regina Mundi—designed by none other than his brother–in–law Mike. Tonight, as chairman of the Club’s fiftieth anniversary committee, John O’Gorman can make Pat Roche proud. For the past year, he has coordinated all the preparations for the Grand Ball.